This gorgeous white silk dress is made by Susanne Lively, a leading designer of special occasion wear for more than 25 years.The short cap sleeves and fitted bodice are trimmed with silk ribbon. 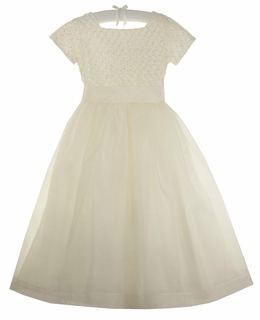 The very full tea length skirt has a layer of white silk organza over white satin and it has an attached crinoline slip. 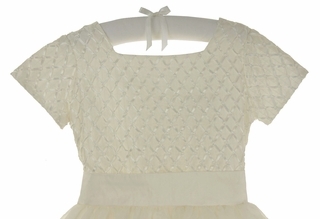 The dress closes in the back with pearl buttons and has a wide white silk sash to tie in a bow in the back. Perfect for baptisms, first communions, flower girl dresses, wedding attire, portraits, and any very special occasion!